Borrowing money is a big decision. One major factor in whether or not someone decides to borrow money from a lender is understanding how much of a loan they may qualify for. For those in financial trouble, or with bad credit, just asking the question of “how much personal loan can I get?” may cause anxiety. Ease some of the stress of not-knowing by getting the details on how lenders assess individuals for loan money and how to improve your chances of getting the loan money you need. Most personal loans are fixed rate installment loans for borrowers to use on any number of expenses or purchases. They can be used to consolidate or tamp down existing debt, to make a large purchase that enhances your quality of life, as a means to improve your overall credit score or even to start a business. They are usually offered in amounts that range from as little as $500 to $100,000 and the amount of the loan and terms depend on the overall creditworthiness of the borrower. These loans are usually unsecured, which means that borrowers don’t have to offer collateral for the loan in most cases. Personal loans are convenient for dealing with unplanned expenses, like emergency medical or veterinary care, and consolidating credit card debt for a lower interest rate and better pay off schedule. In America today, where too often families rely on credit cards and accumulating debt to get by, “how big of a loan can I get?” is bound to be a concern for citizens seeking help to pay down debt or upgrade their lifestyle. Here’s what you need to know about the lending process to determine if you might be eligible for a personal loan at a favorable Annual Percentage Rate (APR). How Do Lenders Review Loan Applicants? Each will be described below in more detail. 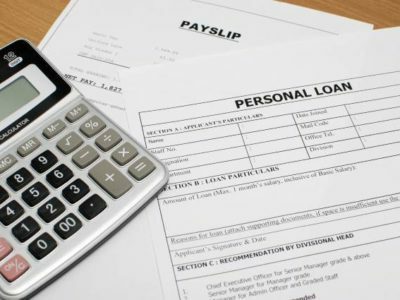 We’ve been discussing how much you can get for personal loans online, but the lenders seek to understand why it is you want one at all. That’s because what you plan to use a loan for can impact things like interest rate. Lenders will typically look at this holistically and include considerations like credit mix diversity and how many recent credit applications you have made. Debt-to-income ratio is pretty straightforward. But this compound phrase can also be a source of stress for borrowers looking to get back on their feet after a financial hardship. Your debt-to-income ratio quantifies how much you make in relation to how much aggregate debt you have. It includes your whole mix of debt from credit cards to car loans and mortgages. Even government backed student loans make up a part of your debt-to-income ratio. Not always, but sometimes lenders will consider where you are and where you are going when putting together a whole picture of your creditworthiness. Being a student, for instance, can offer certain loan incentives. Most commonly, when we think about qualifying for a loan with a favorable interest rate, we think about credit score. Your credit score is found using three services: Experion, TransUnion and Equifax. Lenders may use one or all of these sources to make a determination about your score. How Can I Compare Lenders to Get the Best Loan? Using an online service like Bonsai Finance, you can compare lender terms for best personal loans and see what kind of offers may be available to you. If you can pass this simple checklist, you can partner with Bonsai Finance to compare rates and see what options are available for you. You will be asked to enter in some preliminary information and a list of results will be returned to you with options to apply for favorable loans that match your creditworthiness. It’s that easy to compare lenders, online. How Can I Raise my Creditworthiness? If you’re looking for tips to raise your creditworthiness in the eyes of a lender, you are in the right place. In many cases, getting a loan is an option that chooses you due to life circumstance or emergency, not one that you choose. But, if you can, waiting until the time is right to apply can go along way when it comes to loan options. It’s important that you know your credit score and, maybe more importantly, what’s on your credit history report before you decide to get a loan. Pull your own credit reporting to determine if it’s a good time. From the get-go having a higher credit score is going to offer you more options. In addition to understanding the rating system, it’s important to understand the types of credit scores and their ranges. Here are some credit scores lenders may take into account. Experian, TransUnion and Equifax are largely regarded as the most reliable credit reporting. Lastly, pay attention to the whole report. Not just your score. Lenders will take into account blemishes on your credit histories like foreclosures, unpaid bills and high credit card balances. Getting a holistic review of your report prepares you for the kinds of offers to expect. If you’re taking out a loan to stay in good financial footing, in addition to knowing your credit history you also need to have a good handle on exactly what your daily expenses are. This requires most people to have a budget worksheet. If you don’t currently use a budget spreadsheet to understand monthly expenses, here’s a helpful template. When it comes to the application step, make sure you include all the details that lenders need to paint a picture of financial accountability and creditworthiness. This may seem simple, but providing accurate information and being detail oriented is important during the application if you want to secure a loan. Is your monthly income at least $500? –If yes, a loan may be an option for you. Is the monthly installment payment amount for the loan you want to receive less than 15% of your monthly income? –If yes, a loan is sounding even better. Does the monthly installment exceed your minimum account balance over the last three months? –If yes, you may not be ready for a favorable loan at this time. We know the lending process can be tricky and frustrating, and we are here to navigate it with you. Understanding how much you might qualify for in advance can offer some peace of mind for those worried about lending stipulations and terms. To fully understand what you may qualify for it’s important to understand what your credit profile and lifestyle says about you to lenders. Another way to get a feel for what you may be able to borrow is to use a loan calculator, like this one. At Bonsai Finance, we have experts ready to assist you with your loan comparison needs. Contact us today.